Hiroshima Research Papers delve into a story about six different people who survived the atomic bomb. Is the area around Hiroshima still affected by the events of the bombing today? “Hiroshima” written by John Hersey and published by Bantam Books in 1948 is the story of six very different people, some Japanese and some not, who survived the atomic bombing of Hiroshima on August 6, 1945. Each of the six, by circumstances unknown to anyone, were able to survive this catastrophic disaster when more than 100,000 others perished. Was there chance at survival luck or a curse? Their lives would never be the same. On this specific day in August, Dr. Sasaki, a Red Cross Hospital surgeon, took an earlier train to work than usual. This enabled him to take a streetcar from the train terminal promptly instead of his normal wait later in the morning. Once at the hospital, he went to work beginning with the testing of a man's blood, which he drew and took to the laboratory for testing. He no sooner started down the corridor, when the bomb went off, causing him to crouch against the wall of the corridor. His customary time of leaving his house would have placed him in the center of town near the bomb's center, where he would have definitely died. Others in his laboratory were killed. He was to live and aid many dazed, injured, and barely living casualties of this dreadful bombing. It took Dr. Sasaki six months to return to some normalcy. His idealist nature was now gone, taken by the realities of such devastation experienced by the people of Hiroshima, but he was able to find solace in his work at the hospital and he eventually married and began a new life. Miss Toshiko Sasaki, no relation to the doctor, was a young woman, twenty years old, who worked in the personnel department of the tin works factory. Her desk was situated far from any windows but behind her were some tall bookcases full of books. When the bomb went off she became pinned under the falling bookcases and all of the books. Her left leg was twisted and broken as the weight of the books crushed upon her. After several attempts by rescuers, Miss Sasaki was finally removed from the debris. Through the help of many passer-bys she finally ended up at the Red Cross Hospital. She was very sick and took many months to heal not only physically, but mentally and emotionally. Her life was changed forever, her fiancé never returned, her leg would brand her a cripple for life, so she turned to Catholic Church for strength to move on. 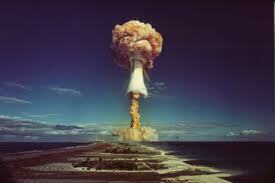 Jus in Bello - Research Papers delve into an order placed on the dropping of the atomic bombs on Hiroshima and Nagasaki. America in World War II - The US was active in World War II in the following specific ways: Pacific Offensive; Battle of Guadalcanal; D-Day Invasion; Okinawa; Hiroshima; Nagasaki; V-J Day. 1945 - Research Papers go into the major events of this year including bombing of Hiroshima an many others. Vietnam War - Order a research paper on the Vietnam War from Paper Masters. Geneva Convention - Geneva Convention Research Papers delve into an order placed on the dropping of the atomic bombs on Hiroshima and Nagasaki. War Crimes - Murder or deportation of civilians to slave-labor camps was one of the War Crimes during WW II. Osaka - Osaka was established as Japan's capital during the seventh century. Japanese Attack on Pearl Harbor - research papers are history essays on Japan's entry into WWII. Warning Signs of Pearl Harbor - research papers are samples of papers on the signs that Japan wanted to attack the United States. Paper Masters writes custom research papers on Hiroshima and delve into a story about six different people who survived the atomic bomb.